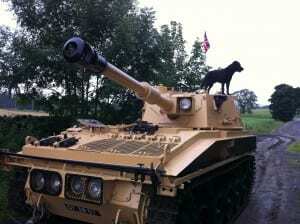 Mark Beaumont replaces his bike for a tank with the help of TDS. 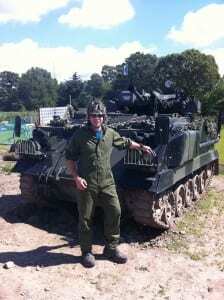 Mark arrived at Tank Driving Scotland complete with troops. Fortunately the weather held off and sunshine all round was the order of the day. The squad of guys got into the spirit of the day and donned the outfits with specially prepared make up (cause they’re worth it!) 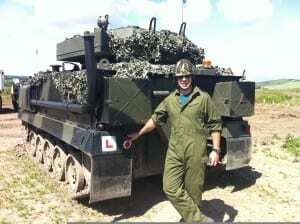 and took control of one of our fantastic machines which was then followed by a half day of action packed paintball including being dropped off into battle by tank. Mark and the guys loved their day so much with us that they have given Tank Driving Scotland the seal of approval, a rematch may well be on the cards! After a Couple of weeks in the workshop the Abbot Spg has been stripped of all the old moldy paint with an air chisel as in some places the paint was about 5mm thick! Desert sand was the first choice and after a couple of coats the Abbott was looking on top form, all the additional parts were detailed in black to make the Spg look like a mean machine. Tank Driving Scotland has been lucky enough to bring on board to it’s collection of vehicles a BAe Tracked Rapier Missile Launch platform. 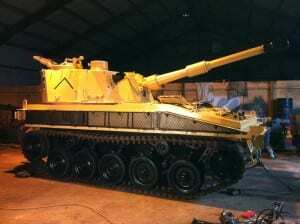 This vehicle is a ground to air, radar guided missile launch and only a limited number of these still exist in the UK. This is a fantastic machine to drive with easy access for drivers as entry is through a car style door rather than climbing down a hatch into the drivers seat. 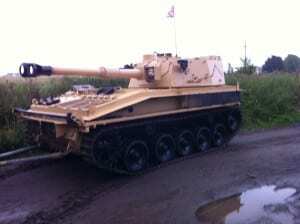 The vehicle is ready for service and will be available shortly as a driving experience.